PharmaMar (MCE: PHM) has presented positive results from the ADMYRE Phase III pivotal trial of plitidepsin in combination with dexamethasone versus dexamethasone alone in patients with relapsed or relapsed and refractory multiple myeloma. The data presented at the 59th American Society of Hematology annual Meeting & Exposition from December 9th to 12th in Atlanta, was already submitted to the EMA in the framework of the assessment process of the Marketing Authorization Application (MAA) for plitidepsin. The poster entitled "Randomized Phase III Study (ADMYRE) of plitidepsin in combination with dexamethasone vs. dexamethasone alone in patients with relapsed/refractory multiple myeloma" presents the data obtained from the ADMYRE pivotal study that enrolled 255 patients, after at least three, but no more than six prior therapeutic regimens, from 83 medical centers across 19 countries (including the U.S, Europe and Asia-Pacific). On March 31st of 2016[i] , PharmaMar announced the study met its primary endpoint. In the group of patients who received the combination of plitidepsin with dexamethasone (n=171), according to the investigator´s assessment, a 3.8 month progression free survival (PFS) was observed in comparison to 1.9 months on dexamethasone alone. According to the Independent Review Committee (IRC), the progression free survival was 2.6 months for the combination versus 1.7 months for the dexamethasone monotherapy arm. The study met its primary endpoint, this being the improvement of progression free survival. Plitidepsin showed a statistically significant reduction in the risk of progression over the comparator. With regards to overall survival (OS), a statistically significantly superior increase in the plitidepsin plus dexamethasone arm was observed according to the two-stage Latimer et al method. In the patients that received the combination with plitidepsin, the registered overall survival was 11.6 months against the 6.4 months of the comparator. According to the IRC, the objective response rate (partials + best response) in the patients that received plitidepsin was 13.8%, with a median duration of response of 12 months. In the patients that responded to the treatment of plitidepsin with dexamethasone (12%), the registered median overall survival was of 37.8 months, and in those that reached stable disease (65%) the OS was 17 months. With regards to adverse effects, the hematological toxicity was low. The most common toxicities, hepatic and muscular, were transient and in a majority of cases were reversible and manageable when applying a dose adjustment. One of the most common grade 3-4 treatment-related adverse events (% of patients in Arm A/Arm B) was myalgia (5%/0%). The most common grade 3-4 hematological/non-hematological adverse events (% of patients in Arm A/Arm B) were: anemia (31%/35.4%), thrombocytopenia (22%/27.9%), neutropenia (16%/5.1%), CPK increase (20%/0%), ALT increase (14%/0%) and AST increase (9%/0%). Most of these events were transient and reversible. 15 patients (9%) discontinued treatment due to treatment-related adverse events in Arm A; 3 (6.5%) in Arm B. During the presentation of the results at the ASH meeting, a comparative on the treatment related deaths of different compounds already approved for multiple myeloma: plitidepsin with dexamethasone, 0.6%; pomalidomide with dexamethasone, 4.6%[ii]; panobinostat with bortezomib and dexamethasone, 7.8%[iii]; daratumumab, 0%[iv]; bortezomib, 1.3%[v]; and lenalidomide with dexamethasone, 2.8%[vi]. In the ADMYRE study, the evolution of performance status was evaluated, this meaning that the time that patients took for their physical condition to deteriorate and that this affected their everyday life from the beginning of the study was calculated. The patients treated in the plitidepsin plus dexamethasone arm took double the time to performance status (PS) (4.6 months) in comparison to dexamethasone as a single agent (2.3 months). 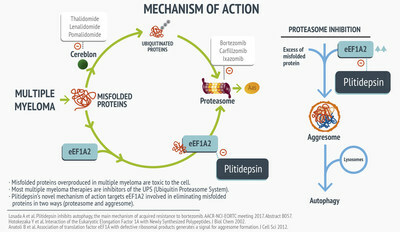 The target of plitidepsin is the eEF1A2 protein. The bonding of plitidepsin to this protein blocks its pro-oncogenic property and impedes the transportation of the misfolded proteins, which are toxic to the tumor, to the proteasome for their destruction. It also inhibits the activation of the aggresome by eEF1A2 and the destruction of the aggresome in the lysosome. This provokes an excess of misfolded proteins, this causing cell death through apoptosis. Other treatments are complementary to plitidepsin and they are going to block the proteasome or the cereblon that identifies the misfolded proteins. In another in vitro study that PharmaMar has also presented at the ASH Congress, it is concluded that plitidepsin also has the capability of cancelling out the activity of the osteoclasts, the cells responsible for bone destruction, in a concentration of up to 100 times less to that which is considered necessary for the elimination of myeloma cells. ii. San Miguel J, et al. Pomalidomide plus low-dose dexamethasone versus high-dose dexamethasone alone for patients with relapsed and refractory multiple myeloma (MM-003): a randomised, open-label, phase 3 trial. Lancet Oncol (2013) 14 (11): 1055-66.
iii. Richardson PG, et al. PANORAMA 2: panobinostat in combination with bortezomib and dexamethasone in patients with relapsed and bortezomib-refractory myeloma. Blood (2013) 122 (14): 2331-7. Richardson PG, et al. Panobinostat plus bortezomib and dexamethasone in previously treated multiple myeloma: outcomes by prior treatment. Blood (2016) 127 (6): 713-21.
iv. Lonial S, et al. Daratumumab monotherapy in patients with treatment-refractory multiple myeloma (SIRIUS): an open-label, randomised, phase 2 trial. Lancet (2016) 387 (10027): 1551-60.
v. Richardson PG, et al. Bortezomib or high-dose dexamethasone for relapsed multiple myeloma. N Engl J Med (2005) 352 (24): 2487-98.
vi. Dimopoulos M, et al. Lenalidomide plus dexamethasone for relapsed or refractory multiple myeloma. N Engl J Med (2007) 357 (21): 2123-32.